This is what happens when you run over your sunglasses. I had just finished walking the dog; apparently my sunglasses, which were hooked on the front of my top, fell, unnoticed. After loading the dogs in the car, and starting off, I heard a loud POP. When I stopped to investigate, I found my shattered sunglasses. Shadow Shot Sunday is hosted by Hey Harriet, please go over there to see all the Shadowy people. And then you grabbed your camera and made a picture of it? Oh dear, you're even worse than me!! But it does make a great shadow picture, that's right!! Aww... that's not really nice hearing the big POP but showing the shadow shot is fantastic one! Yikes! Sorry about the sunglasses but they sure did make an interesting shadow!! The things we do for a good shadow...bummer about the glasses, hope they weren't prescription. A great shot! I've just taken up photography recently and I quickly became obsessed! Sorry you lost your glasses, but glad you got such a great shot!! Happy New Year! Sad about the broken sunglasses, but they certainly created an artisitic shadow shot! Poor you, poor sunglasses, interesting shadow shot! Augh!! 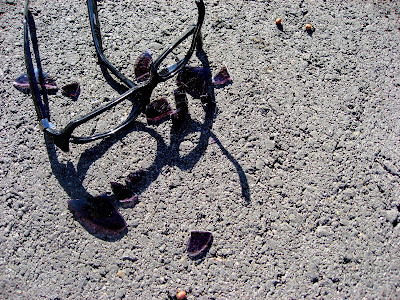 Smashed sunglasses.....a super shadow - isn't it great that you could find something "good" in a mishap! Sad story but it made for an interesting photo. Cool shot. Very unfortunate or fortunate happening. All depends on how you look at it I suppose! LOL Thanks for stopping by my place. Have a great New Year! Sorry, but I did laugh at your misfortune. It's fabulous you can see the bright side and used your shattered glasses as your shadow shot. Hope you have a happy New Year! ps great excuse to buy some new sunnies. Sorry about the broken shades, but the do make a cool shadow shot!